The Slurry Spreader traveled to its home lobby today. 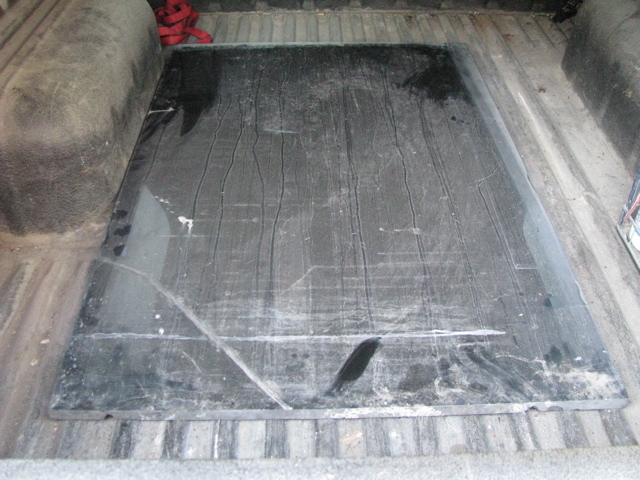 5 grits of crushed granite looked great in the sectioned bed of the spreader vehicle- the patron had his outfit crush the same type of granite loaded in the “dump” vehicle. They can crush stone to any grit, and the grits range from pebbles down to powder- all sparkling pink/white/black. 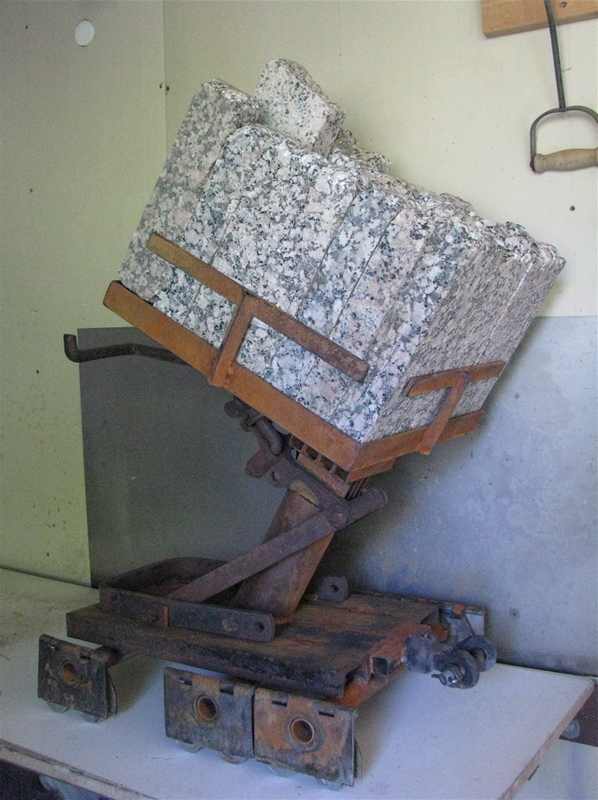 The granite fit into the dumper for the first time since adding the T-bar. In my geometric imagination it all worked fine, but it is nice when reality matches. The next Check is to remove all the stone, put the two sculptures back on the slate, and reload the stone plus add twenty pounds of sandbags to the Slurry Spreader. 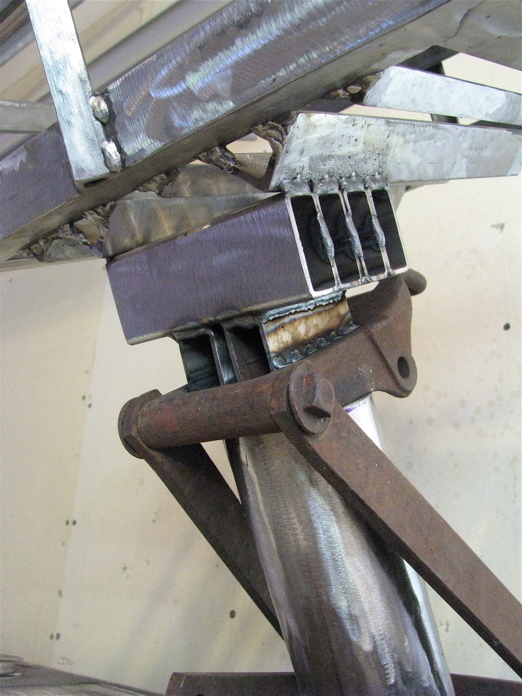 The last image shows the run of steel across the surface of the slate that holds the sculpture in place, and its removable aspect. 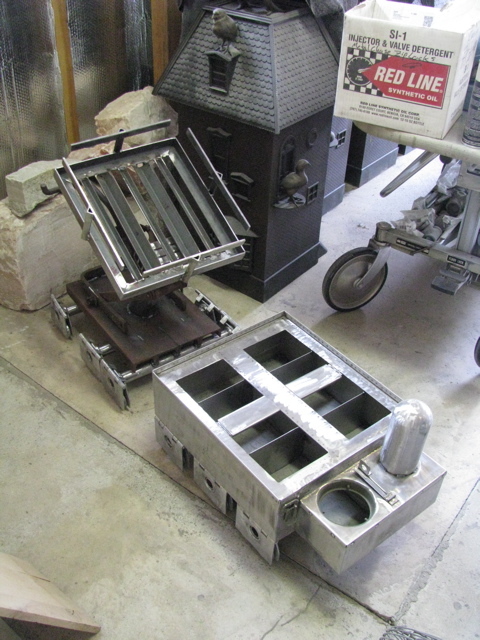 Also pictured are two newly added runs of narrow gauge rod that stabilize the slate. 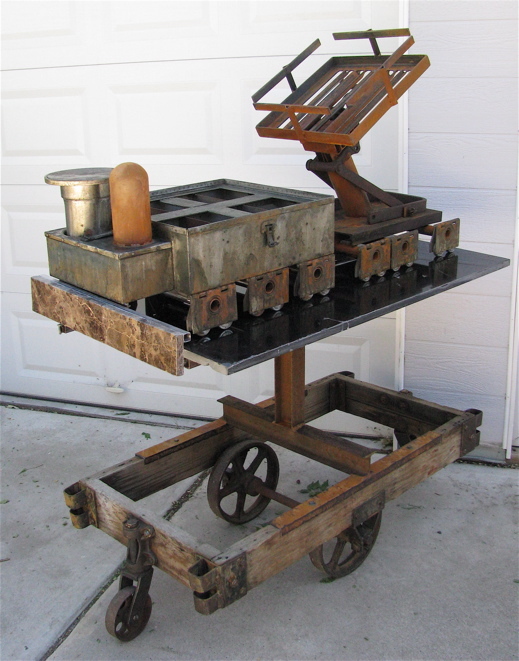 The cart tips back & forth on its small wheels, and the heavy slab of slate amplifies the cart’s action. Add to that the unloaded sculptures and the I-Beam showed some flex when banging the cart over the lip from the garage to the driveway. To ensure that there is never any problem I added the two runs of rod. 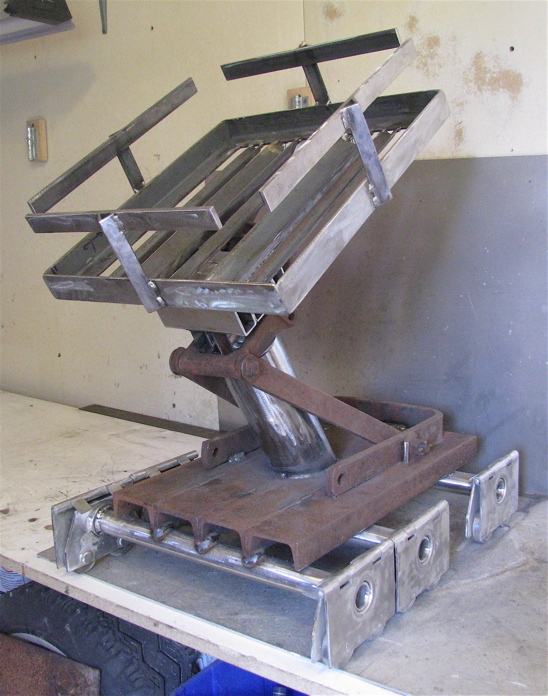 These have a minimal footprint, yet stabilize the entire form and ensure that the weight transfers to the I-beam without flexation. I picked up an air hammer awhile back, but never got around to fitting out it’s air connection as I am usually carving alabaster and rough the forms out by hand. 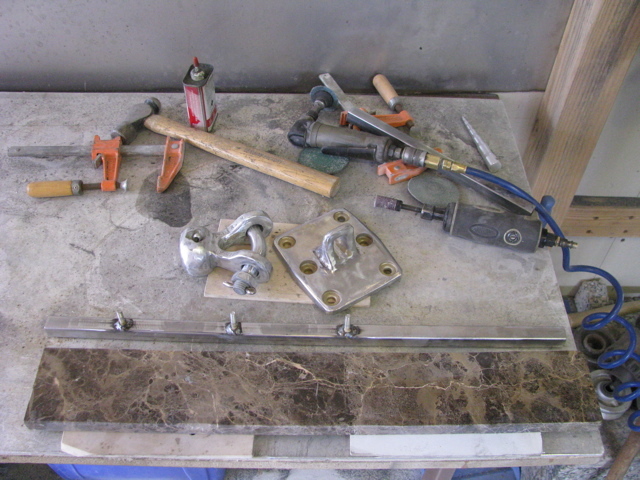 After fruitlessly banging a cold-chisel against the granite, I was ready to head out and buy the connections for the air hammer- first I scrounged around a bit (re-scrounged, as I had already tried to connect the hammer weeks before) and this time finally found the parts! 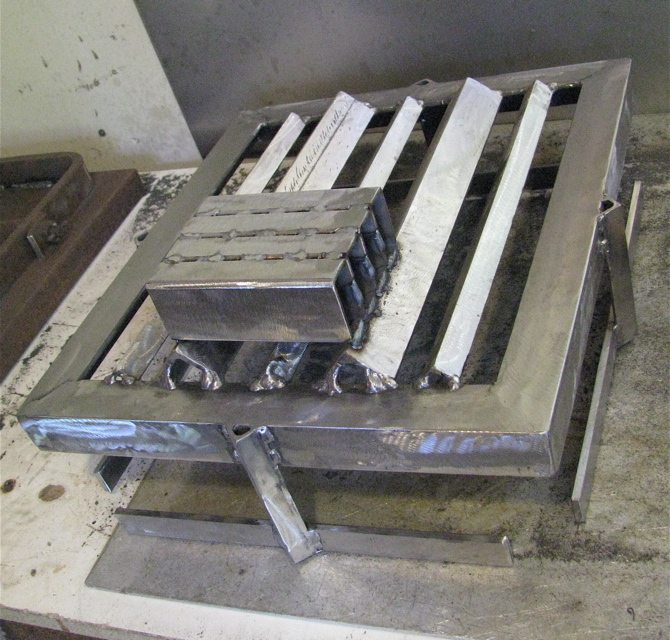 The granite wore down an air chisel in seconds- ratatatbbrrrrt…gone. I dialed back the stroke and put in a short single-point. That did it. I had to be careful, as although the stones are very hard, they are also brittle and tend to snap in half rather than let an edge trim off. Friday saw the Slate connect to the cart. 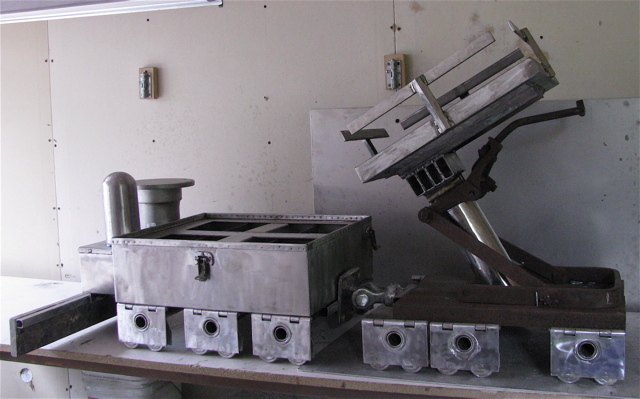 The short horizontal run of square tubing is glued to the slate with Liquid Nails. Prior to gluing I clamped the bars in place, gapping them from the longer bars with washers. 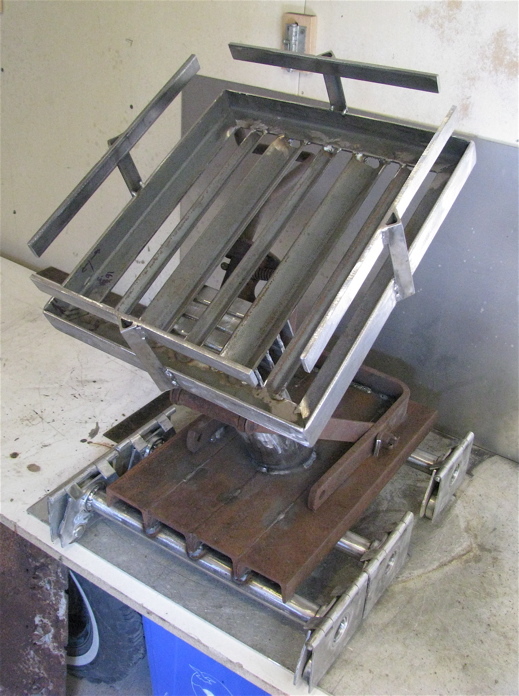 This ensures that the slate can be removed/re-set without too tight of a fit, which could then snap the slate. With the bars and spacers in place I drilled a pair of holes for each side. I took off each of the short tubes and ran a bead of Liquid Nails along the top, then pushed them up into place and tightened them into place with bolts. While the glue set I wiped all the metal down with acetone, then began etching the metal on the base and the sculptures with chemicals, encouraging rust and copper tones. Once this bit in, I hit with liver of sulfur to tone things back. Over the course of the weekend I continued to spray the forms with water and/or chemicals to further activate the oxidation process. Some steel alloys had high iron content and turned deep orange, while other alloys reacted more to the liver of sulfur going gray or black. 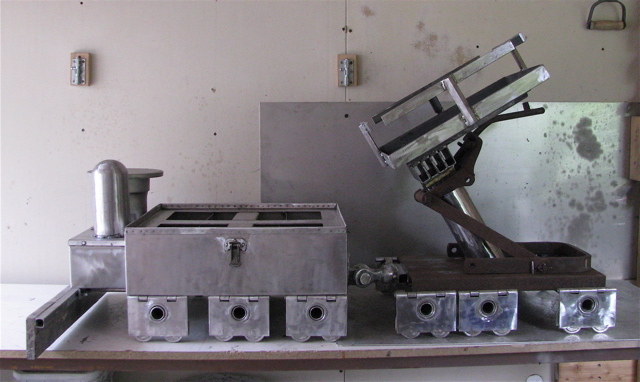 The variety of oxidation adds to the effect of long hard use. Today was spent getting the two machines to mount onto the slate. 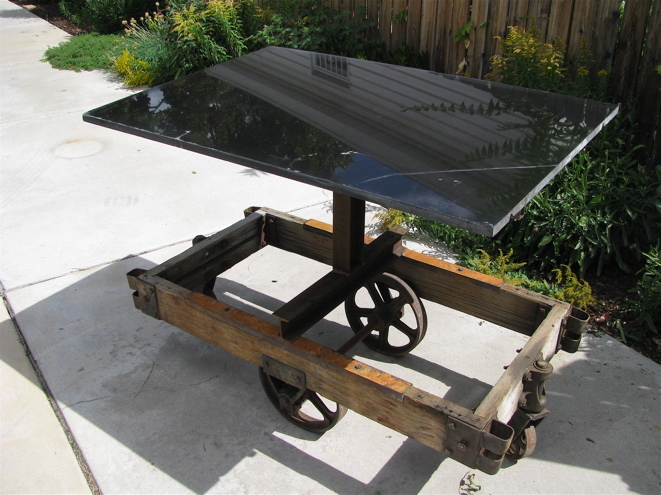 This was a bit of a trick, as they wanted to roll off or just slide off sideways- steel wheels on slate is like skates on ice. I came up with a system that keeps everything from sliding or running off either end, all with a run of small angle-iron attached to a riser of square-tubing. The square tubing sleeves over a smaller square tubing that seats into the big runs of square-tubing supporting below the slate. 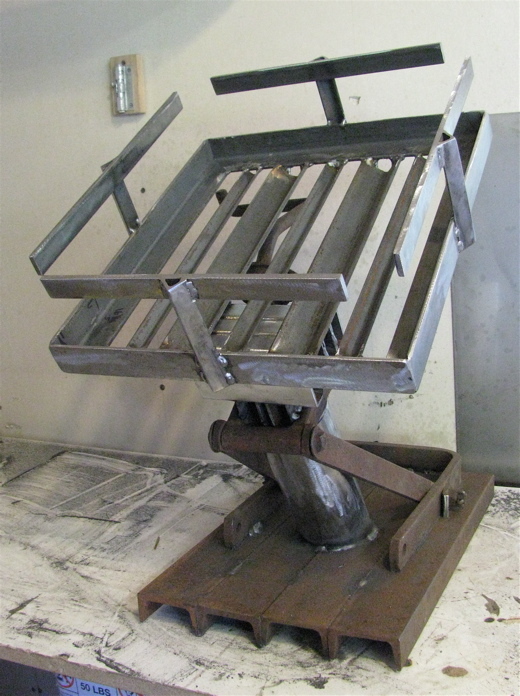 With a bolt run through both sizes of tubing to keep everything in place, and also allowing it to be removed, so that the slate top can be removed for transport. It is fairly well hidden from the front, although it runs the entire length of the forms and the slate. 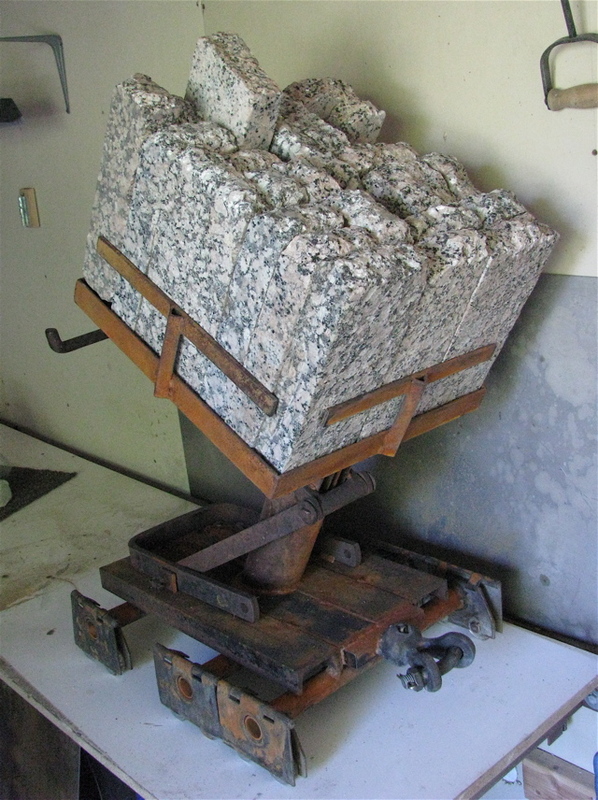 This is an important consideration, as there will be as much as 200lbs of granite added onto the already weighty machines. 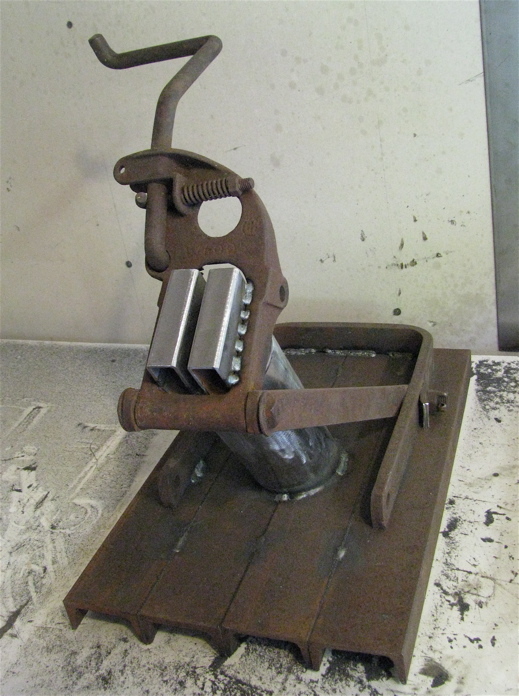 The metal of the slurry spreader is an odd steel alloy that is resistant to rust. 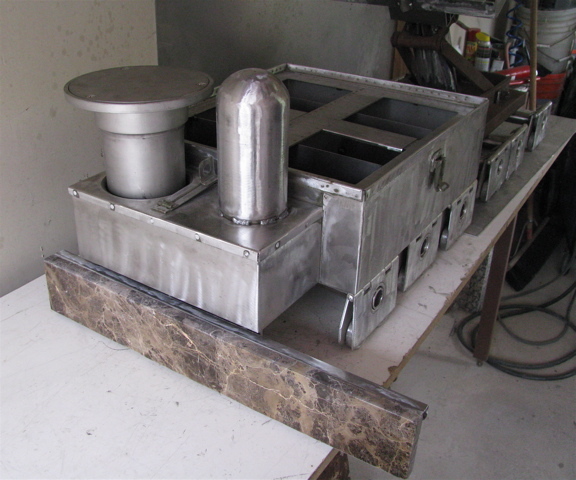 With heat and multiple chemicals it began to etch, and it has a great relationship with the marble that represents the slurry spray. 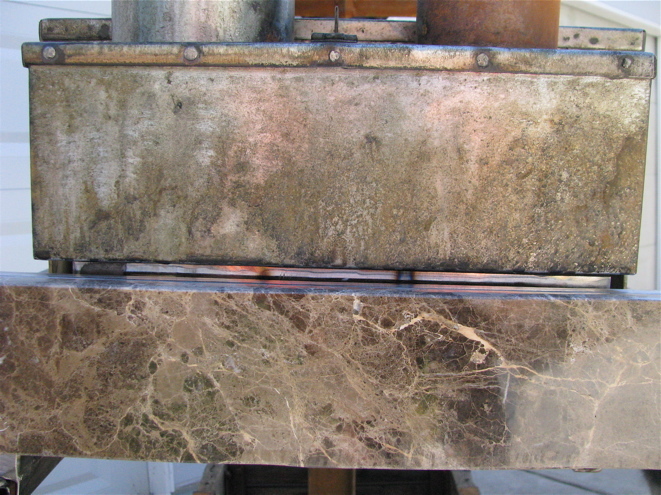 The spreader seems as if it has taken years of fine spray from the marble. 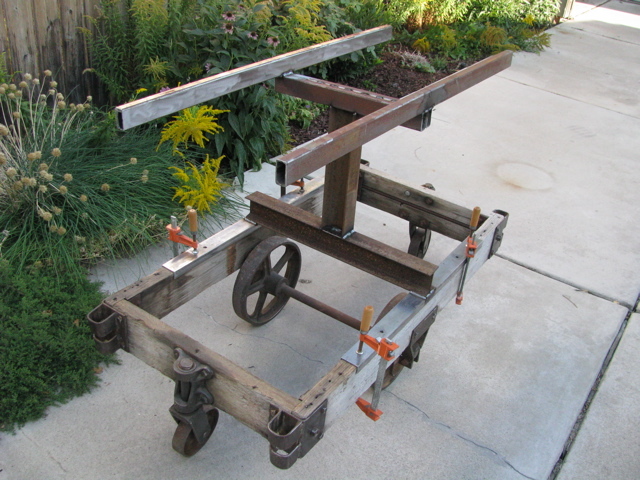 The vintage cart went to the drawing board today, going for a minimal structural design accomplished with hefty I-Beam welded to channel iron that caps the wooden beams. 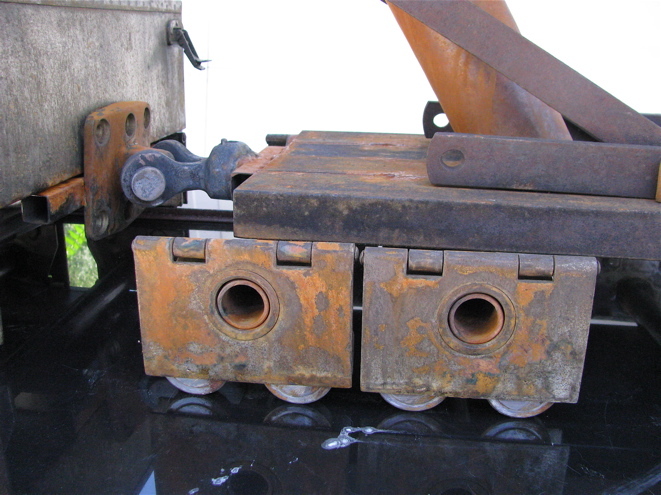 The orange clamps will be replaced with 1/4″ wood bolts. Another I-Beam rises from the center of the spanning beam, and is topped with two runs of heavy-walled square tubing. Two longer runs of heavy square tubing run in parallel, and these will uphold the massive slab of slate I picked up from George at George’s salvage this afternoon. 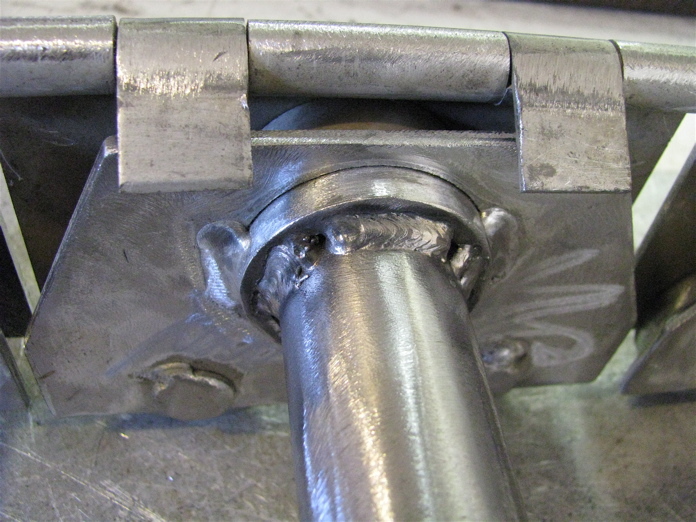 More square tubing will be glued to the bottom of the slate, running alongside and bolted to the parallel tubing. 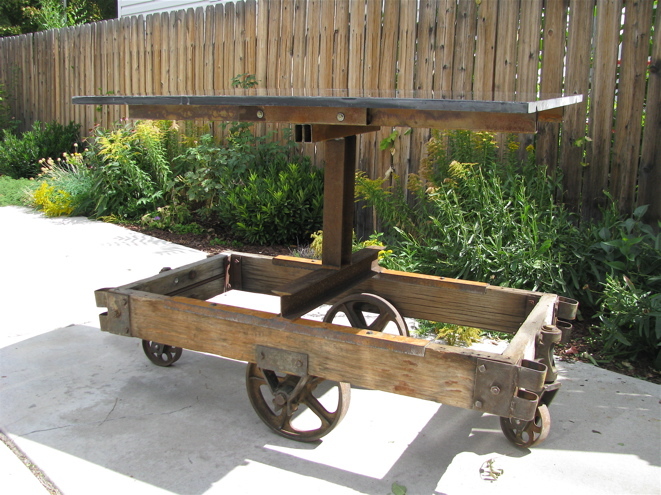 The plan is to have additions read as a natural extension of the cart, read as old-world industrial strength, but almost disappear under the slate. I will rust-etch all the steel when it is together. The base should read as intrinsic to, yet somewhat anecdotal to, the entire work. Too big and heavy to lift out of the back of the truck until the Cart is ready to hold it. It is dusty, but under the dust it is a deep glossy starless midnight. Metal scouting turned up the “top-hat” riding shotgun in the big hole. Top-hat plays well with the cylinder, they have complementary visual weight and a nice interplay of round/flat. 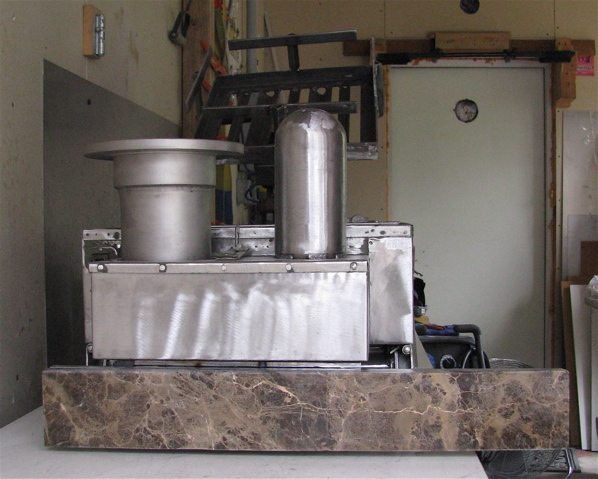 The marble adhered to the steel backing bar, and is mounted and floating just above the ground. The slurry mixer is hitched to the dump truck. The curved Y hitch has a curved threaded bolt/nut with a pin: it is a unique form I found rooting around in an ancient store of military hardware. 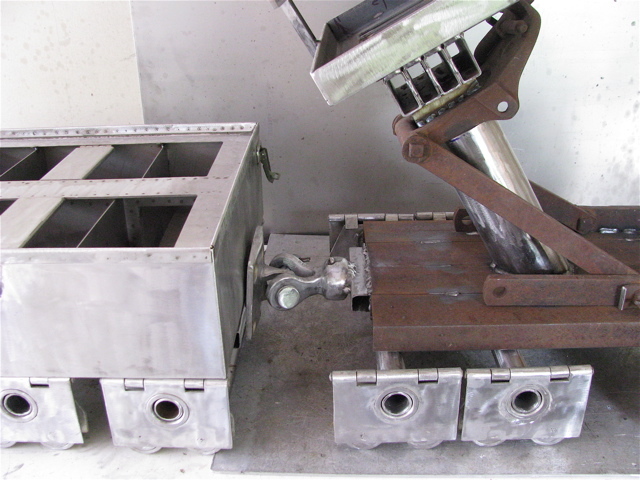 The female side has a weld hidden under the vehicle to a flush-mount square-tube welded to the twin chassis struts, just as it would be if this was a real vehicle. 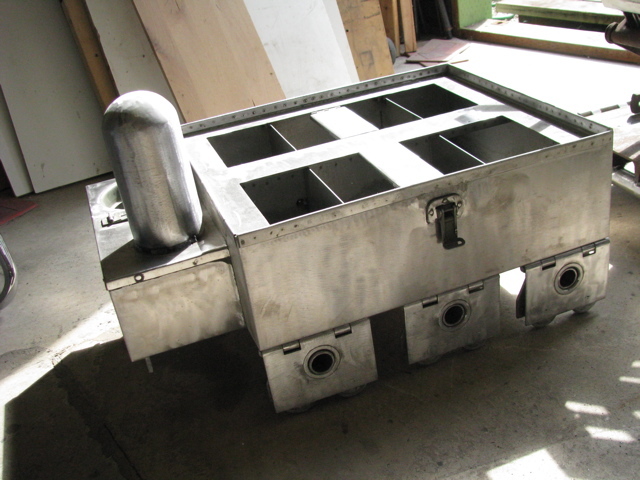 The Slurry Spreader started her day getting 4 dividers cut to fit and welded into her box- these areas will each have a different grit of ground granite. 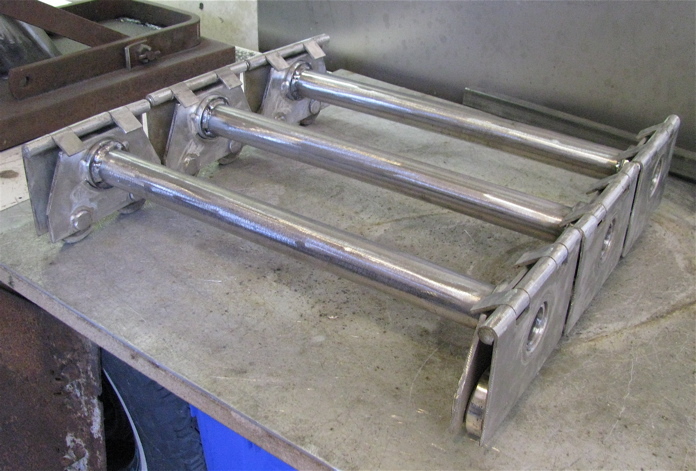 Next the wheels were welded to the axles, and two square tubing runs were welded to her belly- then the axles were welded to the square tubing. 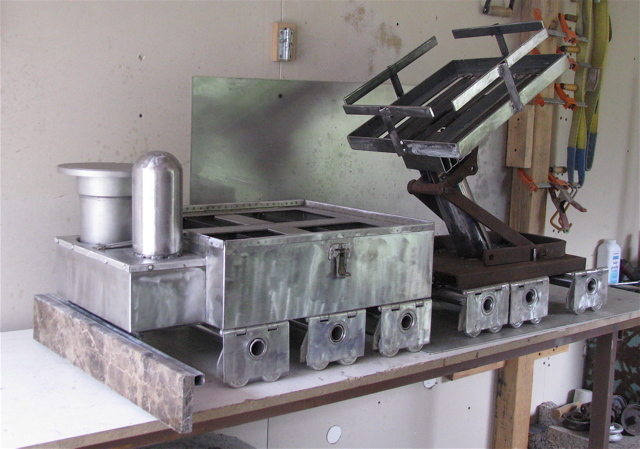 She now has a sturdy chassis (there are picts of this lay-out on the Aug 14th post, where I figured out what to do but waited to weld until I knew where I was going with the Dumper). Her water tower welded into place as well- I have yet to resolve what will happen with the larger circular hole next to it. 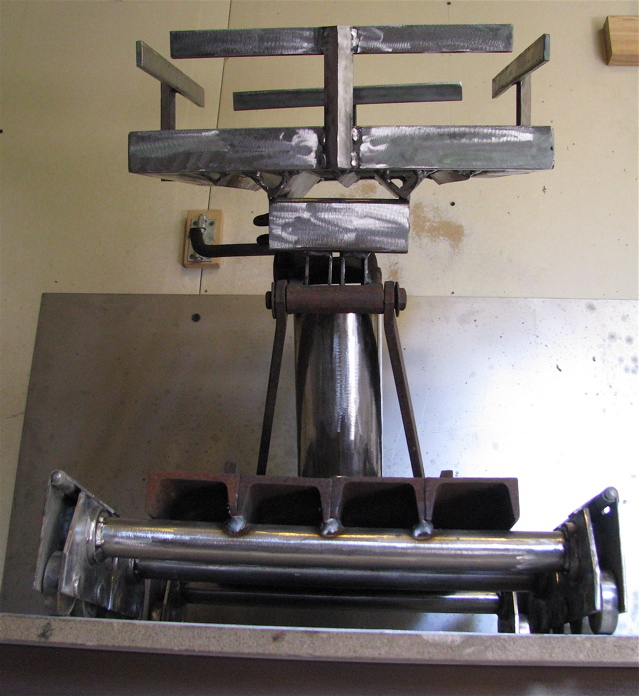 I fit a bar across the front/underneath with three holes drilled to match the welded bolts on a 24″ run of square-stock. 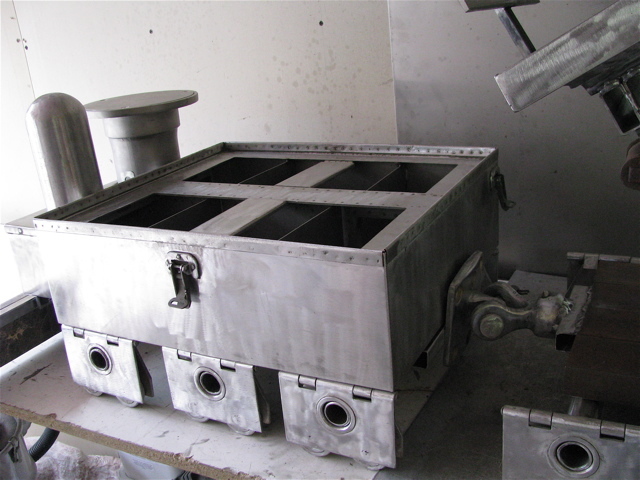 The square stock floats out to the side suspending a 24″ length of pretty brown marble- representing the slurry spraying onto the road. I had to switch from a metal blade to a diamond blade to cut the marble. After cutting it to fit, I polished the entire stone. Also pictured with the marble are the fat pin & hasp I will weld on tomorrow. The marble and square-stock are glued and clamped overnight, I’ll mount it tomorrow to check and removed it to keep the marble safe. Monday. Started with Elizabeth & I lifting weights with P90X, then I filled up her bike tires on her commuter tank and she rode in to work. Next it was walkies for Stanley, watering the back yard, fixing the pond from yesterday’s fixing, breakfast, then on to artin’. Thought I’d see what could get done on a Monday out in the metal shop. 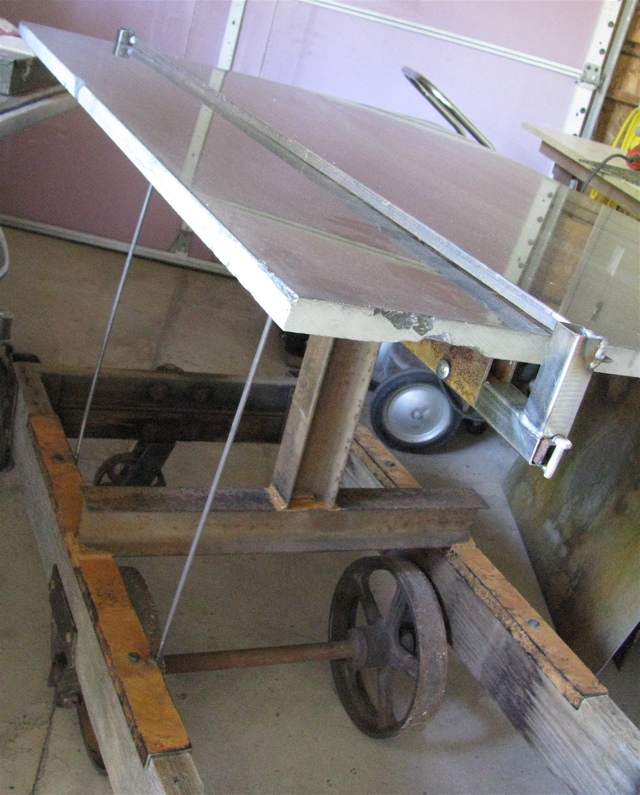 The first project was creating the connections to bring the Lift and the Bed together to form out the dump truck. 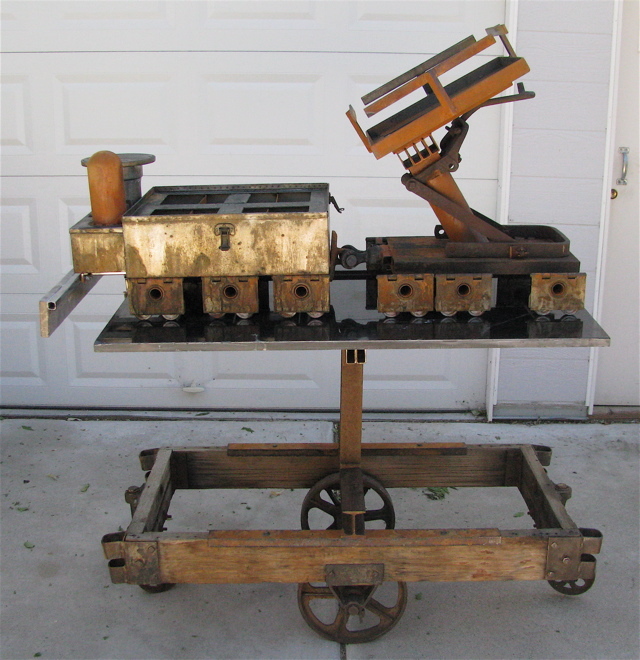 Once that was figured out and done, it was on to prepping 3 axles and 6 sets of wheels (12 wheels). 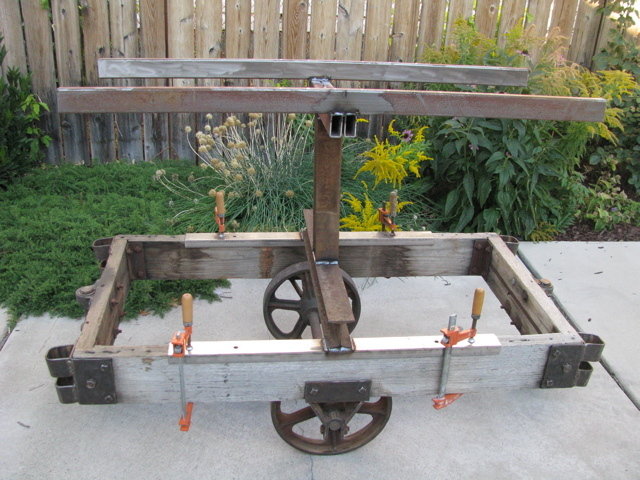 Once prepped the wheels were welded to their axles, keeping everything nice and square. Then it was on to mounting the dump truck onto the chassis. 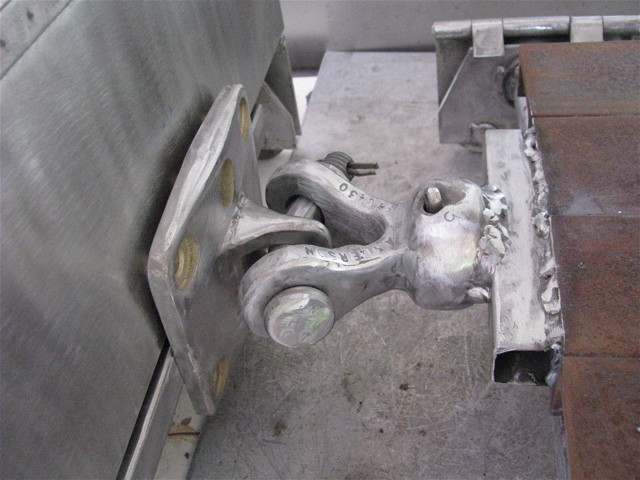 I welded from underneath, keeping the long running outside edges open and connecting the 3 inner beams.